Like many games bearing the RPG genre tag on the App Store, Elementalist (Free) isn’t what you would consider a traditional RPG. There’s not much in the way of questing, exploring, or party-building. Instead, the game focuses on the combat, giving you control of a mage who has to cast his or her spells in turn-based battles to take down the monsters threatening the world. The main hook of the game is in the spell-casting itself. Each spell is represented by a symbol, and how well you trace it determines both its power and effects. It’s a fun mechanic seen infrequently enough in games that, combined with some decent character building options, makes Elementalist an interesting and enjoyable game, if a little repetitive. 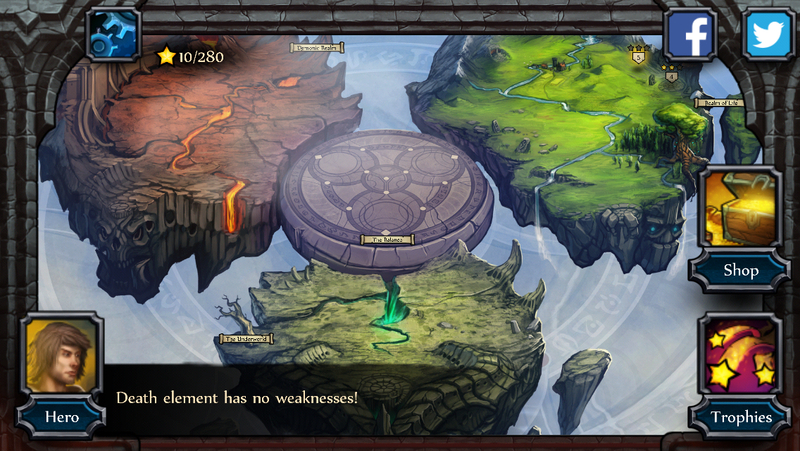 The barely-there story has you playing as a young Apprentice Mage, fresh out of the academy. When monsters begin to attack, it’s up to you to defend your world and figure out what’s behind all of this. You can initially choose between a male or female main character, though it’s purely a cosmetic choice. 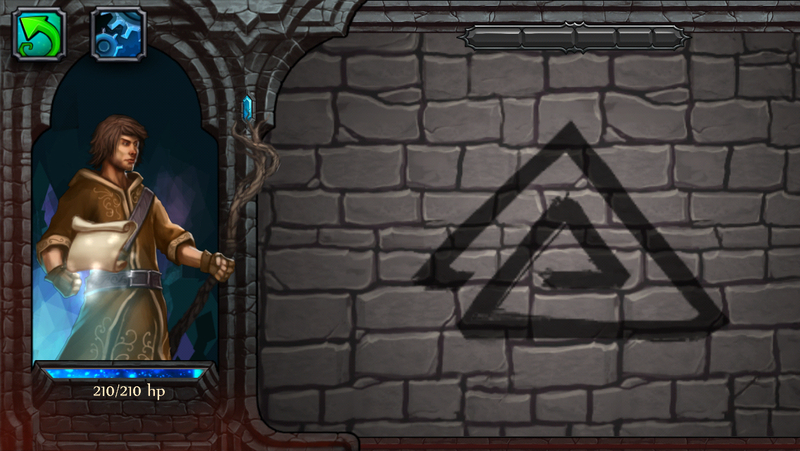 Later on, you can unlock different heroes who have extra abilities and modifiers. The story is told almost entirely through brief snippets before and after each battle. It’s not that unique or particularly well-told, but hey, it at least provides some minor incentive to keep going beyond just the enjoyment of playing. The game is broken up into 75 missions that are scattered across a few different areas. Each mission is comprised of a battle against one or more enemies. You have to take down all the enemies in the mission without being healed between rounds, and it gets quite challenging in a hurry. As mentioned before, your means of attacking is by casting magic spells. You’ll start off with just a couple of spells, but as you play along, you’ll unlock plenty more, both by completing story missions and by purchasing them in the shop. Each spell is associated with one of the five elements of the game, which form a sort of circle of vulnerability, so for example, fire is weak to ice. To cast a spell, you simply choose it, at which point a symbol will appear on the screen for you to trace with your finger. The more accurately you draw the symbol, the stronger the spell will be. If you manage to trace it near-perfectly, the spell will produce an extra effect in addition to doing the maximum amount of damage. A healing wind spell will remove any negative status effects on your character, while a fire spell will give the enemy a burn status that will do damage over time. These extra effects are the keys to winning tough battles. In any given battle, you can only choose to bring four spells in with you, so you have to think very carefully about both the elements you want to use and the extra effects that are important to you. Of course, you also need to be able to draw the symbol for the spell, so if you have trouble making a sweet Dreamcast logo, you might want to leave the Ice Shards spell in the shed. Battles are turn-based, and continue until either you or the enemy reach zero hit points. When the enemy is attacking, small shield icons will appear that you can tap to deflect some damage, which is a nice little touch that gives you something to do when it’s not your turn. The enemy has to draw the symbols for its spells just like you do, and it will sometimes hilariously flub the spell, which makes a little puff of air come out instead of the attack. Luckily, the developer realized that watching a computer draw a picture isn’t much fun, so you can easily skip past those bits by tapping on your screen. There are quite a few different enemies to fight, including some seriously tough bosses, but they mainly have access to the same abilities you do, so it’s easy enough to plan a strategy around them. At the end of the battle, you’ll be awarded up to three stars depending on how many perfect spells you launched and how well you deflected enemy attacks. Defeated enemies drop some gold, which you can use to upgrade your character. This is where the IAP comes into play, if you choose. You can buy gold, of course, and you can also pick up a doubler for three dollars. If you buy the doubler, you get the added bonus of removing the ads that pop up before each fight, essentially offering you a premium experience if you’d prefer that to the free model. The amount of gold you get from each fight picks up as you play through the game, so even though the prices on some of the stuff in the shop probably looks a little crazy when you first start, it actually ends up curving out nicely even without the doubler. In addition to the main stages, there’s also an arena that offers up random battles with the chance to win some sweet prizes, which is a great way to earn some nice gear early. Playinig the arena requires tickets that are usually dropped by bosses, but if you manage to clear all of the quests, you get unlimited access to the arena, at which point you can just go bananas earning everything. There’s a lot of stuff to buy from the in-game shop, too. New characters, spells, and equipment are found there, offering you plenty of ways to customize your character. Having studied under the tutelage of Lord Beavis, I opted to build my character for extra fire damage and extended burning, but you can go anyway you’d like here. You can also spend your coins upgrading your spells, which increases the amount of damage they do as well as improving the extra effect from drawing them perfectly. You can’t just upgrade them willy-nilly, however. They have to be ready to level up, and the only way they get that way is if you use them in battle. The better you are at drawing them, the faster they’ll be ready to upgrade, so if there’s a useful spell that for some reason you aren’t using because it’s not strong enough, you’d best start using it. All in all, the amount of equipment and spells means there are tons of options for how you want to build your character, which is something I always like to see. You’ll need to take advantage of this flexibility if you want to reach the end of the game, however, because some missions are quite hard, requiring you to exploit your opponent’s weaknesses as much as you possibly can. The game looks pretty good, though part of that is in knowing its limitations. 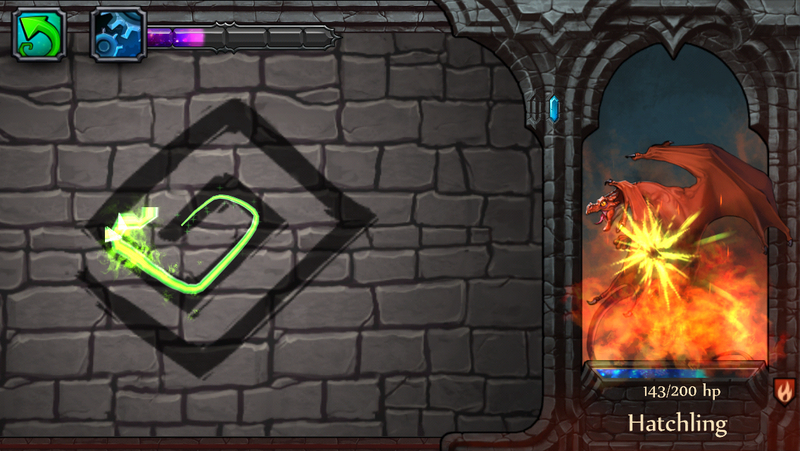 Most of the art in the game is static, with spells throwing out some simple animations. The art style is actually pretty good, with some really cool monster designs. The music and sound effects are just sort of there, neither impressing nor detracting, which is a bit of a shame, because it would add a lot to the game if the sound effects of spells had a bit more oomph, especially when you draw them perfectly. In terms of extra bells and whistles, there’s not much here. The game seems prime for multiplayer action, so hopefully that’s something the developers are thinking about for an update or sequel. I think to properly enjoy this game, you have to be able to get into two things. First and foremost, you have to like that drawing mechanic. It’s probably not for everyone, but it’s what the whole game hangs around, and if you can’t reliably toss out perfect spells, you’re going to get nowhere fast. You also have to enjoy getting into the nuts and bolts of setting up your character, because that’s also important to keep your progress moving steadily. Fortunately, the game is free, so you’re able to try it out and see if those aspects are good for you, and if you like what you see, you can choose to keep playing the whole game for free, or toss a few bucks in to make it ad-free and closer to a premium experience. The combat itself can get a bit repetitive, but I certainly enjoyed my time with Elementalist, and so did a lot of people in our forums. It’s worth your time to check it out.